Shell's Stories: Attention Reviewers! I Have a Question for You! So, as you can probably tell from the title of this post, I have a question for all of you reviewers and review readers out there. How do you respond to negative comments on your reviews? Do you attack back? Do you stress that it’s your opinion you’re trying to convey? What do you do? I think I responded with a level-head, if I do say so myself. However, I now realized that I should have stressed some issues more. Like, how people are allowed to react happily to a book and share their opinions over how joyful a book made them, but according to this customer, I am not allowed to express how sad a book made me. I also should have explained that if I were severely depressed—I explained in my review that I was feeling extremely down and useless—his/her comments could have been even more devastating than they already are on my psyche. Thankfully, I’m back to “normal” now, but this comment could have caused me some major problems. Basically, I am posting this because I want to see what you guys would have done if you were me. How would you have reacted to a negative comment, or how have you reacted to a negative comment in the past? Do you still think about the comment today? Please let me know. I don't know about the book you've written the review but let me advise you about something I've seen especially on GoodReads. When you write a review, good or bad, the purpose is to give feedback to the writer, NOT so much on the reader. A potential reader is good to read positive and negative reviews, so there's no reason for anyone to react badly on your review; or anyone else's for that matter. 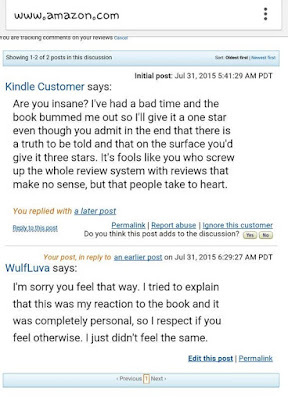 I know users on GoodReads who ALWAYS rate mmost of the books with 1-2 stars and to say the truth it pisses me of. But I've never said anything bad to them because it is not my job as a reviewer to judge. The writer is the one who learns from the experience. Thanks for the feedback. 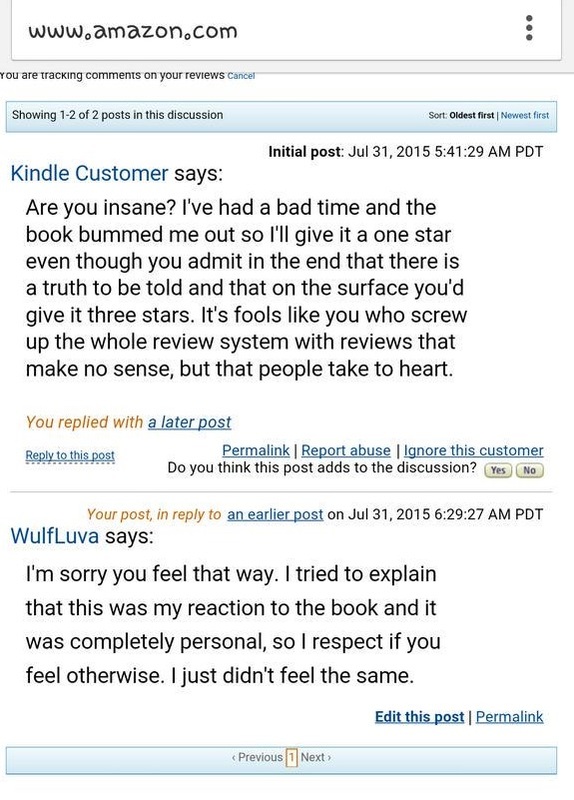 I can't understand only giving books 1-2 stars. That seems strange to do that all of the time. Why would someone read books s/he constantly didn't like? Just to critique?